You can easily view all the resources you have imported or shared from Commons in one place. If you need to remove a resource imported through Commons, navigate to the corresponding area in your course and delete it there. 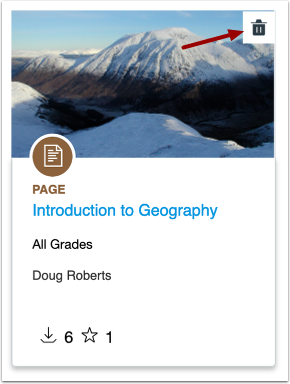 For example, to remove an imported assignment, navigate to the Assignments Index Page in your course to delete the assignment from the list. In Commons Navigation, click the Imported link. 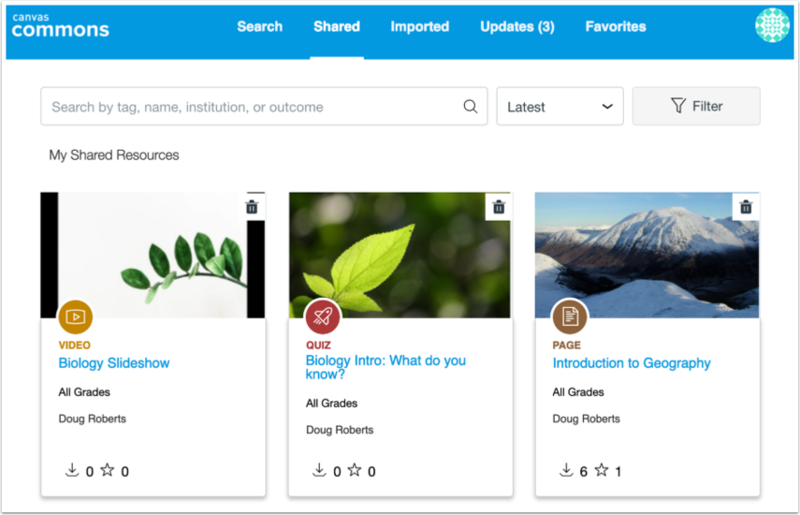 View resources you have imported from Commons into Canvas. Resources are sorted by most recent date. In Commons Navigation, click the Shared link. View your shared resources. Resources are sorted by most recent share date. Click the Delete icon to remove the resource from Commons. You will be asked to confirm deletion of the resource. To confirm and delete the resource, click OK . You will be unable to recover the resource once it is removed from Commons. To cancel deletion, click Cancel . Note: If you delete a shared resource in Canvas, other users will still be able to import that resource until you delete the resource in Commons. Previous Topic:How do I add and manage Favorites in Commons? Next Topic:How do I import Commons Favorites in the Rich Content Editor in Canvas? Table of Contents > All Users > How do I view my imported and shared resources in Commons? Re: Importing updated content from Canvas - what happens?